Google AMP rolled out just a couple months ago and many marketers took little notice. This light-weight and mobile-focused website structure offers a better user experience than the weighed-down resource-intensive stuff most of us are use to, but it got little attention from most in website and marketing circles after release. That’s all about to change with the latest announcement by Google last week. Here’s why you can’t keep ignoring AMP. When Google first announced it would begin testing AMP (Accelerated Mobile Pages) most saw little reason to switch to the stripped-down page structure. Why bother serving your site experience without all the bells and whistles we worked so hard to create, right? As usual, marketers simply thought of themselves, rather than their users. That’s about to change. Google just announced that they’ll begin testing AMP results in normal search results. While they started only showing them in the Top Stories section, this move would indicate that they’re now looking to show AMP results everywhere mobile users search. And that means it’s time for those that aren’t AMP-enabled to take notice. While Google may say they’re only testing this idea right now, the direction they’re headed is clear. Mobile now accounts for almost 60% of searches and that number continues to grow. Google has put a big focus on the mobile-first mindset. As they continue to push website owners and marketers to focus on the mobile experience, it’s clear that AMP will gain a ranking advantage over those that aren’t catering to the way people want to consume content on the web (no matter what device). Many businesses still haven’t realized that mobile is can no longer be an afterthought but must be the #1 priority. At a recent conference, Google’s Eli Romberg explained that they now look at development as mobile first and foremost, with desktop being something possibly added later on. If Google is making mobile their greatest priority then you need to do the same if you hope to be seen is the current climate of smartphones. The Mobile-Ready Update Google pushed, and the resulting scramble by many to make their sites compliant, will come again. It’s very possible at some point Google will make AMP mandatory for those hoping to appear to mobile searchers. But even if that doesn’t happen for some time, why not give your visitors the best experience possible right now? We know that longer load time negatively impacts your conversion rate, so why miss out by not taking advantage of something that will improve performance? As mobile continues to grow, web developers and marketers must turn their focus towards how people are viewing their sites and optimize for the best user experience. Sadly, many aren’t willing to invest in doing so. Sometimes, they need a push from someone like Google. With AMP showing in the normal mobile search results now, this should be a wakeup call to those that haven’t yet looked to embrace this new technology. 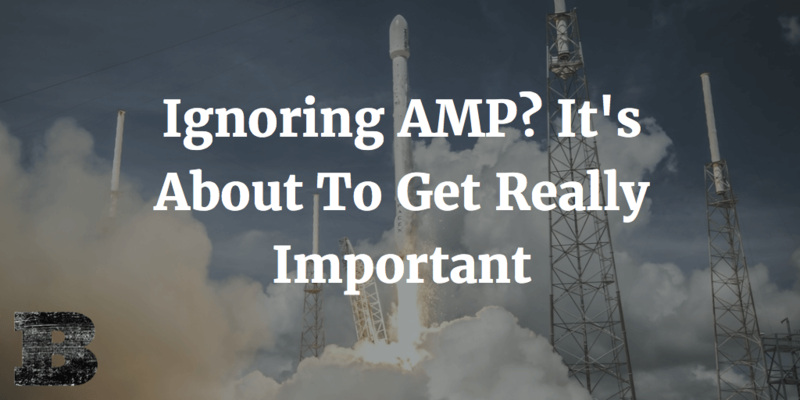 A time is coming when Google will move to make AMP a strong ranking signal, and you don’t want to be left scrambling like many were when the Mobile-Ready Update came along.